Retired State Senator Bob Jackman (PU DVM '67), Senior Veterinary Surgeon Timm Gudehus, President and COO of Centaur Gaming Jim Brown, Dean Willie Reed, Shelbyville Mayor Tom DeBaun, and President of the Shelby County Board of Commissioners Kevin Nigh officially dedicate the Centaur Equine Specialty Hospital with a ribbon cutting during the dedication ceremony April 25. 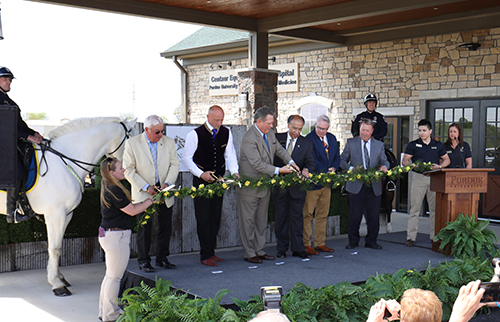 With a crowd of more than 275 on hand, the Purdue University College of Veterinary Medicine held a dedication ceremony April 25 to celebrate the opening of the $8.8 million Centaur Equine Specialty Hospital in Shelbyville, Ind. The satellite medical and surgical facility, located on Interstate I-74 near the Indiana Grand Racing and Casino, provides specialized medical services for horse owners while supporting equine research and the veterinary education of future equine specialists. Joined by the Centaur Equine Specialty Hospital staff and dignitaries, including key supporters and representatives of local government and Centaur Gaming, Dean Willie Reed opened the ceremony by sharing the importance of the facility in enhancing Purdue's role in Indiana's equine industry and the promotion of the health and performance of equine athletes. "Engagement is a key mission of our College," said Dean Reed, "and with this facility, we are excited to build on our long history of delivering top-quality medical and surgical treatment for equine patients at the Large Animal Hospital in West Lafayette." The hospital's team is led by Dr. Timm Gudehus, an equine orthopedic surgeon with an extensive international background in horse racing and equine healthcare. After the ceremony, Dr. Gudehus and others led guests on a tour of the 17,000 square foot state-of-the-art facility, which offers advanced diagnostic imaging, shockwave therapy, regenerative medicine, endoscopy, laser surgery, and specialized equine orthopedic surgery. During the ceremony, Dr. Gudehus detailed his plans to increase the size and scope of his team over time by showing the value of the high-end diagnostic equipment. However, he also emphasized the importance of building relationships with referring veterinarians. "As much as equipment can do, we need to be there for our referring vets to take on as many critical cases as possible, twenty-four hours a day." The ceremony also featured remarks from Dr. Bob Jackman (PU DVM '67), retired state senator, and Jim Brown, president and chief operating officer of Centaur Gaming, who emphasized the importance of the equine specialty hospital in the health of the horse industry for racing, pleasure, and show horses statewide. The Indianapolis Metropolitan Police Department opened the ceremony with a mounted color guard presentation, and a special appearance was made by Big John, a Quarter Horse who raced as a pony, with Jockey Otto Thorwarth, from the movie "Secretariat." A reception followed as well as a commemorative horse race in honor of the College at nearby Indiana Grand Racing and Casino. Click here for more information about the Centaur Equine Specialty Hospital. Follow the Centaur Equine Specialty Hospital on Facebook. Dean Willie Reed (right) with the Centaur Equine Specialty Hospital team (left-right): Dr. Timm Gudehus, senior veterinary surgeon; Shelby Harber, RVT, lead diagnostic imaging technician and surgical nurse; Dr. Kayla Le, staff veterinarian; Cheryl Boyd, LVT, chief anesthesia technologist; and Morgan Allen, RVT, veterinary technician and surgical nurse. 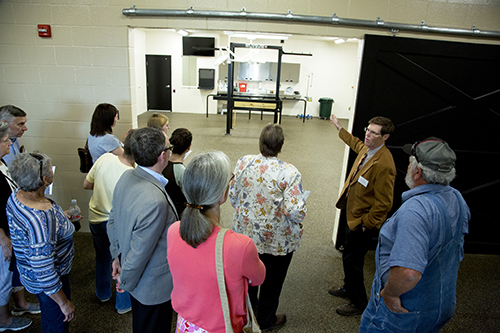 Dr. Steve Adams, PVM professor of large animal surgery and an instrumental team member in the planning of the equine hospital, leads a tour of the state-of-the-art facility stopping in front of an exam room for attendees of the dedication ceremony. Centaur Equine Specialty Hospital stakeholders show their enthusiasm at the commemorative race at Indiana Grand following the dedication ceremony. 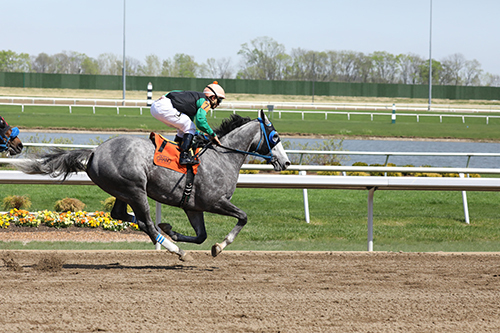 Attendees were treated to a commemorative race at the Indiana Grand Racing and Casino's track in Shelbyville, Ind. 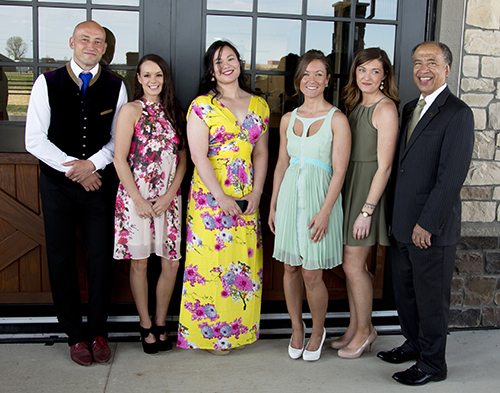 following the dedication ceremony for the Centaur Equine Specialty Hospital April 25.